Prior to the current recession, the deepest post-World War II economic downturn occurred in the early 1980s. According to the accepted arbiter of the economy’s ups and downs, the National Bureau for Economic Research, a brief recession in 1980 — lasting only six months — and a short period of growth, were followed by a sustained recession from July 1981 to November 1982. The unemployment rate hovered between 7% and 8% from the summer of 1980 to the fall of 1981, when it began to rise quickly. By March 1982 it had reached 9%, and in December of that year the unemployment rate stood at its recession peak of 10.8%. The jobless rate slowly receded over the next few years, falling to 8.3% by the end of 1983 and to 7.2% by the 1984 presidential election. The unemployment rate did not fall below 6%, however, until September 1987. In the spring of 1981, shortly before the onset of the painful recession, most Americans were optimistic about their economic future. A Gallup survey at the time found that 48% of the public believed the financial position of their household would be better in the next 12 months. Another 35% believed it would stay the same, while only 15% thought it would get worse. The public also smiled on the newly elected president. In a May poll, nearly half of Americans said the Reagan administration’s economic policies would make their family’s financial situation much better (8%) or somewhat better (41%). Just 37% said Reagan’s policies would make their family finances worse. A year later, in September 1982, with the unemployment rate at 10.1%, most Americans were far from pleased with the state of the economy. A 54%-majority said Reagan’s policies had made their personal financial situation worse; just 34% said the policies had made their situation better. But even as the economy reached its nadir, the public did not lose all confidence in Reagan: In an October survey, a 40%-plurality said that over the long run the president’s policies would make their economic situation better, while a third said they would make things worse and 15% volunteered they would stay the same. Even as the jobless rate remained above 10% and the public experienced added economic pain, those predicting improvement in their finances greatly outnumbered those who anticipated a further weakening. In November 1982, more said their financial situation had gotten worse (37%) than better (28%) over the last year, but Americans believed their personal financial situation would improve over the next year by a 41%-to-22% margin. In March 1983, nearly half (46%) said their personal financial situation had gotten worse in the past 12 months, but the better-to-worse margin for the year ahead remained 45% to 22%. As Andrew Kohut noted in a special to the New York Times, the rising unemployment paralleled a rise in disapproval of Reagan’s job performance. By the summer of 1982, only 42% of Americans approved of the president. Reagan’s approval would eventually hit a low of 35% early in 1983. In September 1982, when the public was asked by Gallup whether Reagan was correct to argue that his economic program needed more time or that Democrats were right in asserting that budget deficits and high unemployment were signs he had failed, half of Americans sided with the Democrats while 43% agreed with the president. A year and a half into his presidency, only 36% of Americans wanted Reagan to run for reelection at the end of his first term, while 51% said they would rather he sit the election out. Of course, the economy eventually did rebound, and so did Reagan’s poll numbers. Much like today, Americans were concerned not only with high unemployment but increasing budget deficits in the early 1980s. A September 1983 Gallup poll found that three-fourths of the public agreed that the federal government’s budget deficit was a great threat (42%) or somewhat of a threat (34%) to the continuing recovery of the economy. Agreement on proposed solutions, though, did not share the ubiquity of concern about the size of the deficit. A poll in the summer of 1983 found overwhelming disapproval for raising taxes (78% disapprove, 15% approve) and making cuts to entitlement programs such as Social Security and Medicare (82% disapprove, 11% approve) in order to address the deficit. 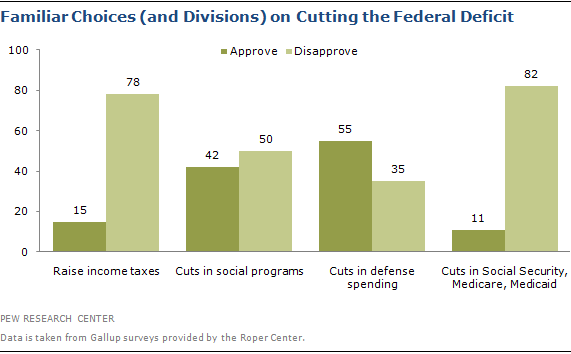 By lesser margins, Americans also rejected further cuts to social programs (50% disapprove, 42% approve) as a solution. With the Cold War front and center during the Reagan years, the public nevertheless gave its strongest support for any deficit-cutting proposal to cuts in defense spending (55% approve, 35% disapprove). While cuts to the government may have been unpopular, the public was not necessarily looking directly to Washington for answers on the economy either. The public started the decade and the recession in no mood for government regulation. 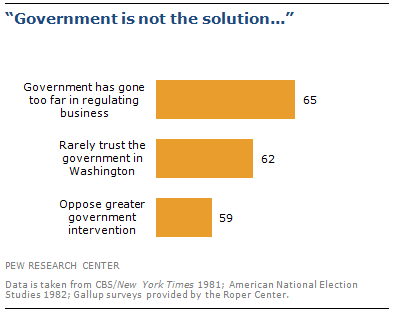 In a September 1981 Gallup survey, fully 59% said they opposed greater government intervention into business, siding with the argument that regulation impairs the workings of the free market system. Just 24% favored greater government intervention to protect individuals from economic abuses. A 1981 CBS/New York Times poll found that two-thirds of Americans completely or mostly agreed that the government had gone too far in regulating business and interfering with the free enterprise system. This may have been the result of a lack of trust in the government. In 1982, an American National Election Studies survey found 62% said they trusted the government in Washington only sometimes and an additional 2% said they never did. Only about a third said they trusted the feds most of the time (31%) or just about always (2%). In a May 1983 Gallup poll, 51% said big government was the biggest threat to the country’s future, while just 19% cited big business and 18% said big labor. Still, the public was not blindly in love with the private sector. In an August 1983 Gallup poll, most Americans said they had only some (39%) or very little (26%) or no (2%) confidence in big business. Just 28% had a great deal or quite a lot of confidence in big business. Banks (then more heavily regulated) fared better, with roughly half the country having a great deal (19%) or quite a lot (32%) of confidence in them. And while regulation may have been an enemy, Americans were not demanding a greater role for business. Half of the public (51%) felt American business should be just about as important as it then was; only 22% felt American business should be more important, with about the same number (26%) saying it should be less important. Is the Recession Linked to Fewer Marriages?